Maybe it is because it is the season of fashion weeks (Fashion Month?) and maybe because I just submitted some scribblings to a fashion mag’s writing competition (in the hope of winning shoes!) but I have of late, found myself musing about the mad, bad and dangerous to know world of fashion. Of course, ten minutes hate is mostly concerned with the iniquities of politicians and the tyrannies of other weak-willed men, and it could be argued that with all the scandals, thievery and corruption in the world, taking a month off to gawk at clothes we won’t even be wearing until next Spring is, well, a bit silly, isn’t it? Once you concede that clothes are about more than protecting us from the elements or saving our modesty on a packed Tube train, everything else becomes a statement of intent. Having a good day and toasting it with bright red lipstick, wishing to hide in a comfy tracksuit, going for the full uniform of whichever tribe you picked: from goth to emo to skater or a million others, even in the anti-capitalist garb of army surplus trousers and ironic t-shirt, you are saying something about yourself when you get dressed each day. To be ‘anti-fashion’ is to be as much a part of the conversation as a member of the front row at any show. True, there are things to hate about fashion. I hate it when fashion is cruel to women by, for instance, offering shoes designed to cause injuries, or making a perfectly healthy girl feel fat, or engaging in excess and waste on a scale not seen since Marie Antoinette was playing at milk-maiding. I also hate when the fashion default setting is ‘how amazing!’ when really it should be ‘are you sure?’, which is why it is so refreshing to read reviews like this one of House of Holland’s show (hat tip to Gem Fatale’s Style Blog for the link). But credit where credit is due, not all fashion swims at the shallow end of the pool. Witness Katherine Hamnett offending Margaret Thatcher two decades ago, Vivienne Westwood matching a natural sense of playfulness with a deeper concern for the world around her, not to mention all the Reds, People Trees and Eduns which seek to bring us clothing grown from renewable sources, made by workers adequately rewarded for their labour and sold with biodegradable packaging. Sometimes fashion proves that it is for the grown ups too. Westwood’s manifesto contains more than a trace of her punk roots and shows that ‘recreating a punk aesthetic’ should be about more than wearing your skinny jeans with too much eyeliner and a safety pin brooch (god help us, I have yet to recover from that one, thanks ASOS.) Do It Yourself and be proud to have your clothes show age as you wear them. 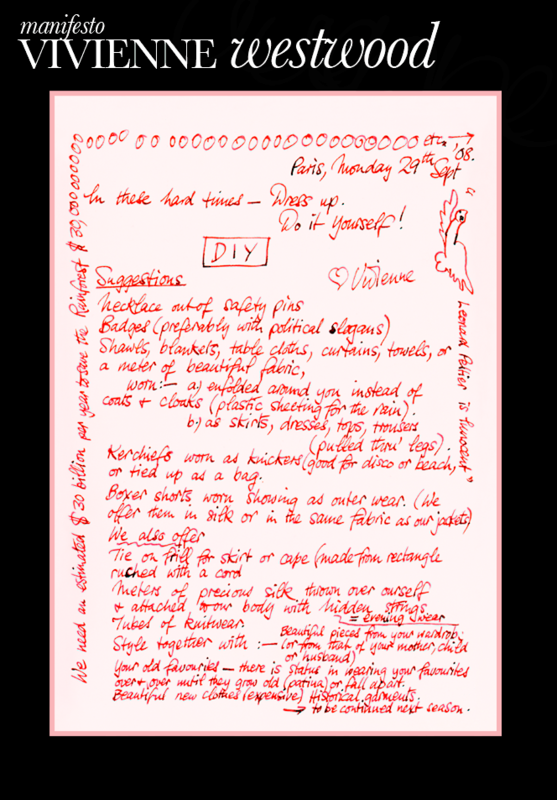 It could be simply a ‘make do and mend’ for the Noughties except for the margin notes added to the handwritten note: exhortations to save the rainforest and support for an Amnesty International campaign. So now that I have proved that you can keep your political consciousness and still enjoy clothes, feast yourself on these images from New York and London Fashion week. A little something for the weekend. Hamnett image from Vogue, Westwood manifesto from Style on Track.